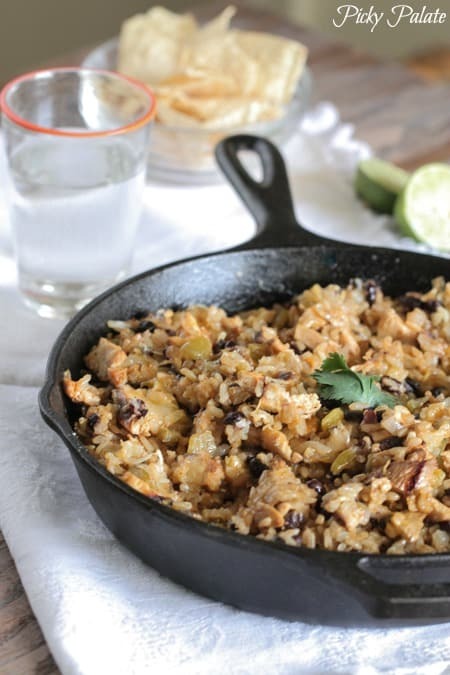 My Chicken and Black Bean Green Chili Rice Skillet makes the perfect quick and simple weeknight dinner! I am always looking for quick and simple weeknight dinners and this one I developed last week was a huge success. We love Mexican dinners every week and this was a great addition to add to my rotating menu options. You can use a rotisserie chicken to save yourself some time, or if you have time I highly suggest grilling up my Taco Lime Chicken. 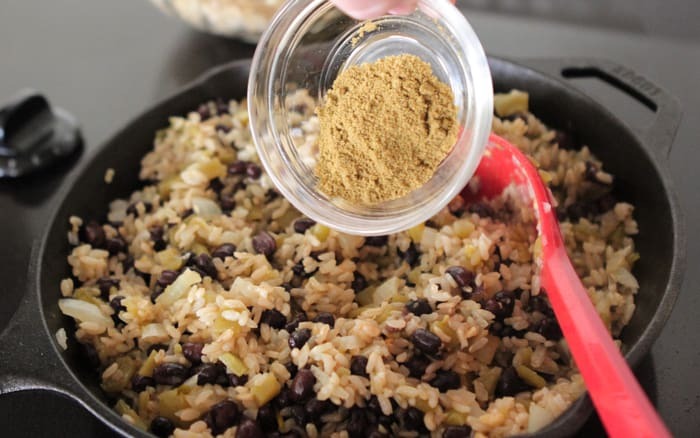 We used it for this recipe and it was the perfect addition with the spices in the rice. Break out your cast iron skillet and try out this zesty chicken and rice skillet this week! Start by sautéing some onion and garlic. 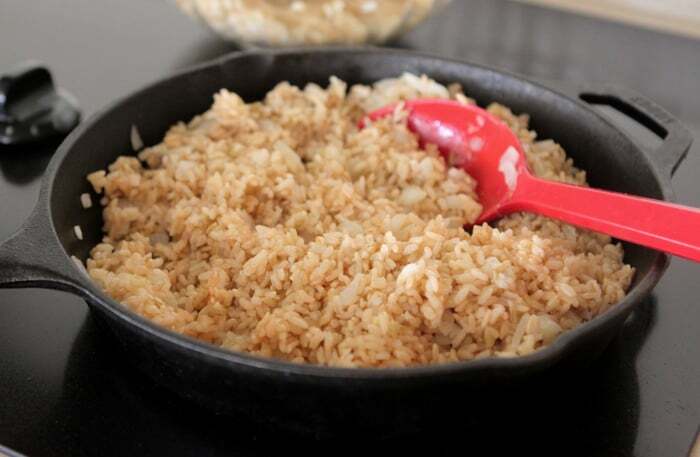 Stir in your cooked brown rice. Some chopped green chiles up next. Cubed cooked chicken. 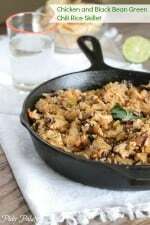 Try my Taco Lime Chicken, it was soooo good in this recipe. A few shakes of your favorite hot sauce. Top with shredded cheeses and time to bake! We enjoyed the leftovers all week long for lunch. This one is a keeper! Preheat oven to 350 degrees F. and heat cast iron skillet over medium heat. Cook rice according to packaging directions and set aside. 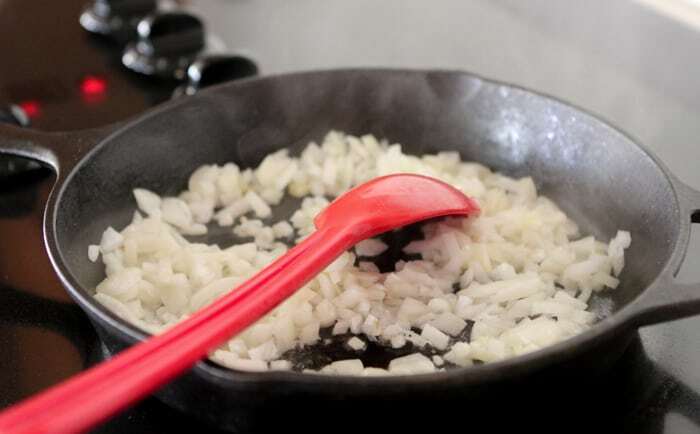 Heat oil in skillet and when hot, add onion and garlic, stirring until softened about 5 minutes. 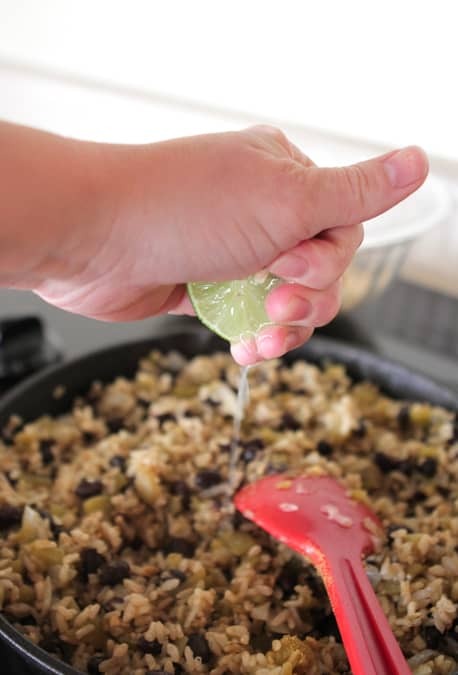 Stir in cooked rice, green chiles, black beans, cumin, lime juice, chicken and hot sauce. Top with cheeses and bake for 15-20 minutes until cheese is melted. Serve warm. Spicy, filling, delicious.. That’s a really great dish! 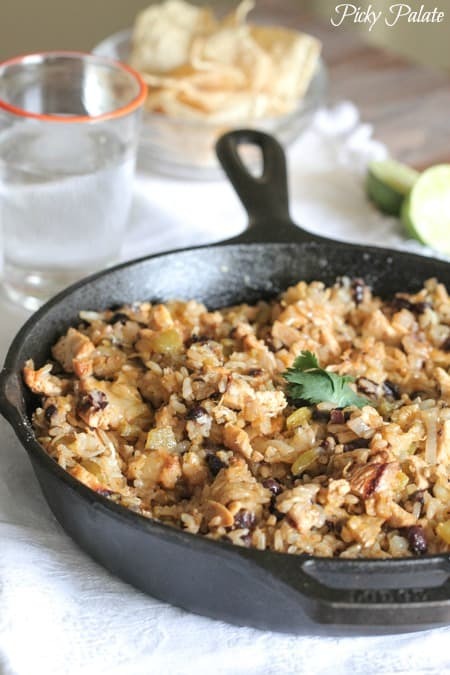 What a beautiful dish, the black beans with the chicken is a stunning combination that is often used in Caribbean cooking. I love the hot sauce and mozzarella cheese. Chicken can be fantastic for weight loss, it works in our dieting group. Love how easy this is! I am definitely always on the lookout for weeknight friendly meals. 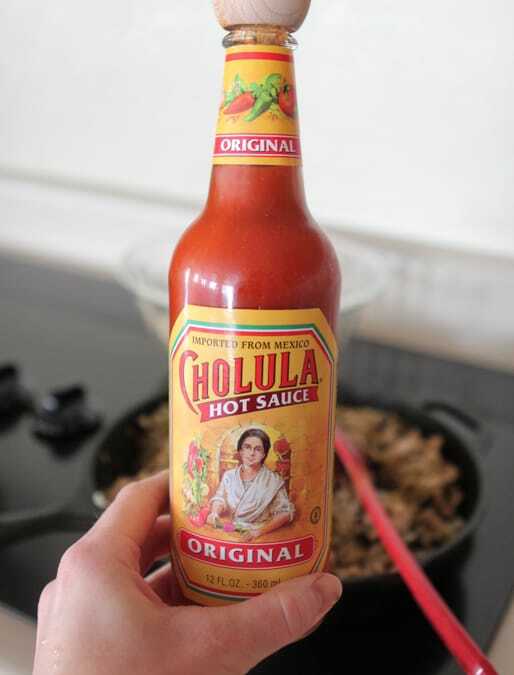 Plus, that Cholula hot sauce is pretty much my hubbies life. Perfect! 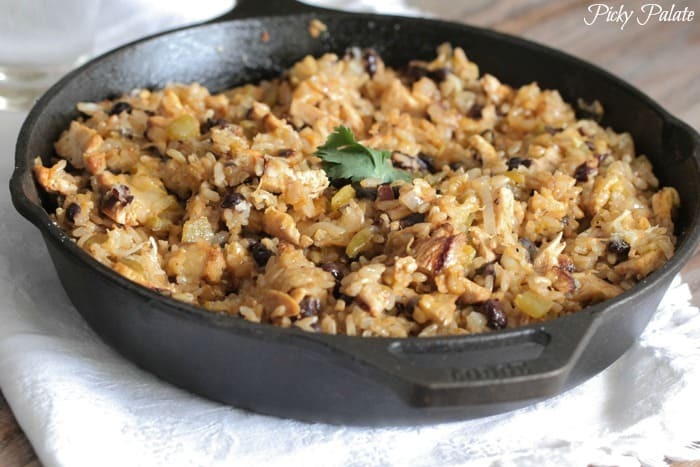 Love one skillet meals and this one sounds tasty! 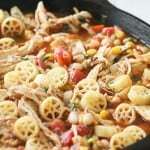 great flavors and I love how you are always thinking fast, easy and family friendly! Im right there with you about easy weeknight dinners — this one is a great one!! Looks so yummy and fast, thanks for another great weeknight meal to add to my rotation! This looks SO good!! I love how quick it comes together. I’d love a large helping, please! Sounds easy, yummy and healthy! Can’t wait to try! Thanks Laurie, hope you enjoy! 1) your photography is amazing – you have got this spot on and i have added some of your images to my Pinterest account. 2)I really like the way that you have set your recipe, it makes for easy reading and following and is one that will be on my list of foods to try. Mmmmm…this so needs to be dinner! Love one pot meals. My family would love this one. Looks so yummy and easy. My family would love this! This recipe looks so yummy. 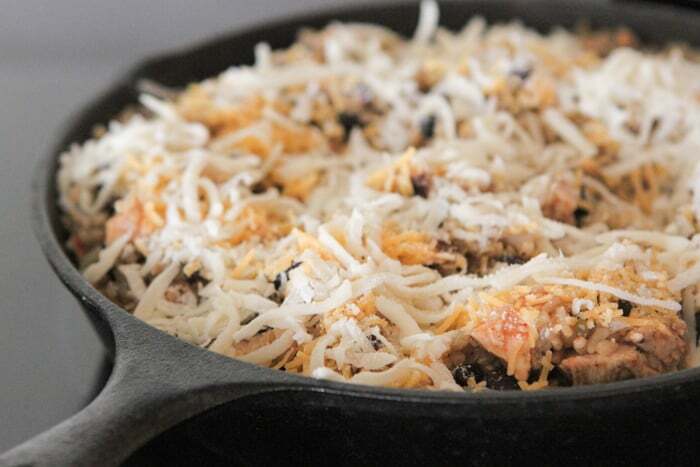 I am always interested in your skillet recipes, but I don’t have a cast iron skillet that can go in the oven. I was interested in buying one for my birthday and wondered what size you recommend. Do you have a favorite? Hi Laura, I’ve always used the Lodge brand. They are inexpensive and last forever 🙂 If you have a thrift store near you, check there, I’ve found some of mine there! Thank you for the nice recipe. Have a Great Week! 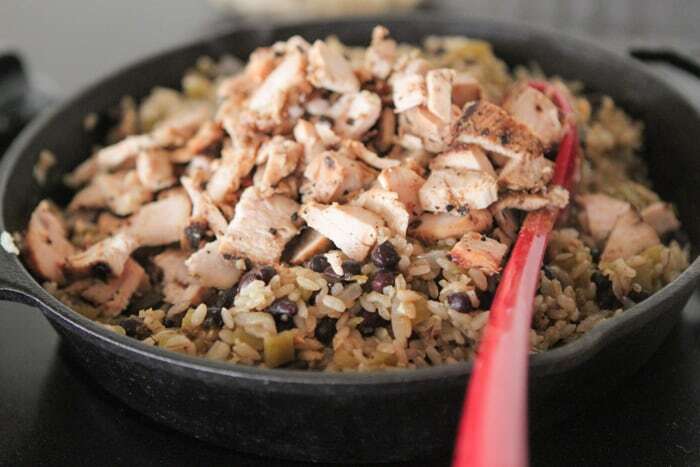 Skillet meals are the best! I can’t wait to try this one!! Thanks Shelly, we love them too! Yes please! Looks absolutely delish! This would be such a fabulous weeknight dinner! These flavors are my favorite!! Love this easy dinner! That looks great! I love the step by step tutorial with the clear photos. I am definitely trying this. Thanks Melen, hope you enjoy!! 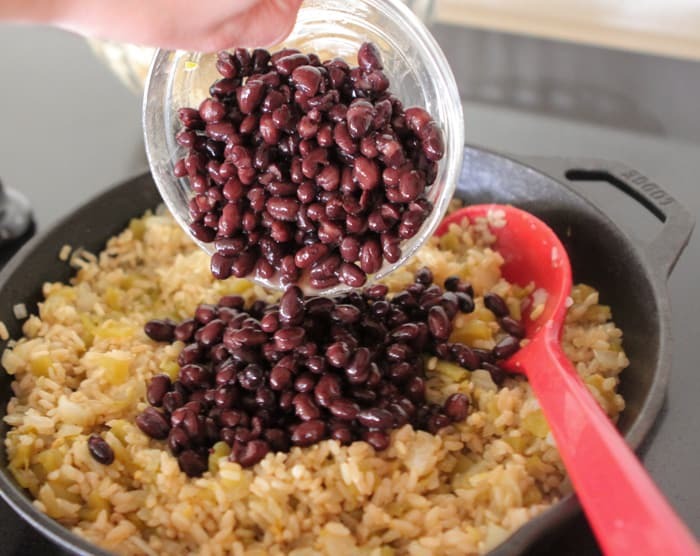 The perfect weeknight meal, always need more of those! Love. Awesome! I’m trying to make weekly recipe planning easier for our family, and have decided to do five ‘theme’ nights each week…one night Italian, one night American, one night Mexican, one night slow cooker and one night just an easy classic (grilled cheese, breakfast, ect.). This will be perfect for Mexican night!! God bless you for the weeknights-dinner-friendly ideas! Just like Natalie, I am trying to plan ahead all the cooking (and shopping groceries for that matter). It is part of a bigger project for me – my new year resolution for time management. I was pretty much sold on this when I saw it’s mexican themed AND chicken. Two of my favorite things. I made this last night for my family and it was a huge hit!! So delicious and oh so easy. The taco lime chicken is AMAZING! Very happy I found your website 🙂 thank you again for a great dish! This may be a stupid question, but can you use just a regular oven-safe skillet if you don’t have a cast iron one? Thanks! Thank you for another great recipe. My family loved this! It was super quick and easy, too. So glad to hear it Mindi, thanks for the feedback. Love this recipe. Not only does it look good, it looks easy enough to create. I am all about easy recipes, especially when its my turn to cook (my husband does 90% of the cooking) and every once in a while I have to cook and that’s when I go online to find something new to create. Thanks so much for inspiring me to make this one pan chicken dish! I made this last night for my BF and I. It was SO delicious!! Hi!! I am making this tonight for dinner – so excited!!! How much is one serving of this? 1 cup? 3/4? Thanks so much!!!! I used a large 12 inch skillet. Hope you enjoy! I love how you arrange the flower in the burlap and how you photographed it. This recipe looks great. I will try it soon. Thank for share ! 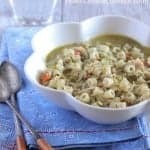 I boiled my chicken first, then shred it for this recipe, then used the water needed for the recipe from the boiled chicken water to add a bit more chicken flavor. I avoided the oil and just added everything into the pan and cooked it, and didn’t have a problem with anything sticking. I added some potato slices for appetite.Thanks for your sharing!